Organized in 1875 from Prospect Presbyterian Church, the First Presbyterian Church has been serving the Mooresville community for over 100 years. We gladly welcome you to this house of God’s church and hope that you enjoy your visit. We are always glad to see new faces and are here to help if you have any questions, concerns, or would like to know more about the church and its service to God within the Mooresville community and beyond. From our preschool programs, to Bible studies, to our mission trips at home and abroad, the family of FPCM works hard to carry forth God's love and word to those in need or to those who simply need a little helping hand as we carry the word of God to the people of God. In 1875, just two years after the Town of Mooresville was chartered, a group of Presbyterians from Prospect Presbyterian Church came together and formed the First Presbyterian Church of Mooresville. The first home for the church was a wooden structure located on the corner of McLelland and Church Street (the present site of the First Baptist Church) until moving to the present location. In the 1890’s, the first building was built for the church which consisted of the two towers, a large square sanctuary and the parlor. The parlor served as the Sunday school building and the main part of the sanctuary. Two large pocket doors slid back into the wall to open up the larger sanctuary where the choir and the pulpit were located. The members of the church sat on curved pews mounted on a sloping floor facing the pulpit. 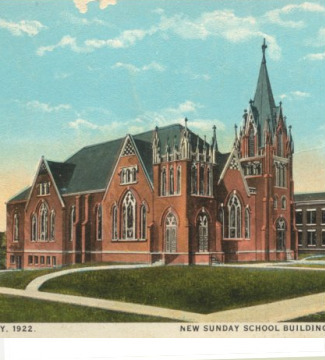 In the early part of the 1900’s the sanctuary underwent its first expansion with the enlargement of the “square” building. The parlor was then closed off and used for class rooms. 1924 the congregation held its first service in the newly expanded sanctuary with the new pipe organ. In 1929 the stock market crashed and the bank sent notice that it was going to foreclose. The shortest service in the church history was conducted as a song was sung and a prayer said with the rest of the day spent raising the money. The church raised the money and paid off the mortgage. After the war and in the prosperity of the post war era, the church saw its next wave of renovation and expansion. The first was in 1940’s with the addition of a heating and air system. The congregation once again had to occupy the Educational building while the ceiling was lowered and the system installed in the sanctuary. Next was the expansion of the choir loft and the rebuilding of the first organ. In 1954, the parlor was renovated to its present architectural appearance and the sanctuary received another renovation. In the mid 1960’s, the second (present) educational building was built and the in the late 1960’s the second organ was installed. In the late 1990’s the sanctuary received its last renovation when it was redecorated in the classic style seen today. The organ console was moved and the red carpet taken up. The church was restored to a look that was more fitting its age and architectural stature to be enjoyed for generations to come.